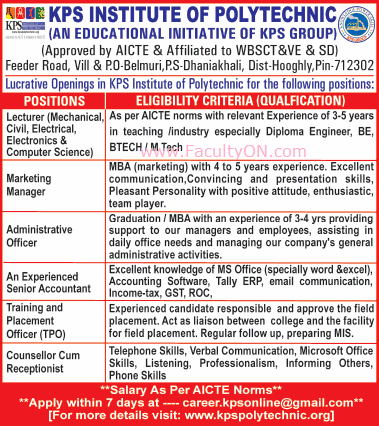 KPS Institute of Polytechnic, Hooghly has advertised in THE TIMES OF INDIA newspaper for the recruitment of Teaching Faculty- Lecturers Plus Non-Faculty jobs vacancies. Interested and eligible job aspirants are requested to apply within 07 days from 14th November 2018. Check out further more details below. About College: KPS Institute of Polytechnic, Conceptualised and Developed by KPS Memorial Charitable Trust, was Established in 2013. The Trust is Constituted and Operated by a Group of Personnel driven by Zeal to Spread Quality Education within the reach of deserving Meritorious Students living in Rural Bengal, who have some difficulties to access City based Institutions. The People at the Helm are Vastly Experienced in Promotion of Education across the State of West Bengal & Beyond. How to Apply: Interested and eligible candidates are requested to send application along with CV, scanned copies of certificates / mark sheets and recent PP size photos to the following email address address.